We only have a few hours left before we say goodbye to good old year 2009 and welcome the year 2010. My previous year has been a roller coaster ride of happy and not-so desirable things that I will forever keep in my memories. There are a couple of things that I need to leave behind to face the coming year with positive thoughts and strong energy. I think almost everyone of us experience the dilemma of nostalgia as the year ends. We feel mixed emotions of loneliness and excitement as we are about to face another phase in life. I just hope that everyone will have a wonderful year ahead. Happiness is a choice. It's a matter of how we look on things. If we want to live a life full of positive energies and environment, we have to appreciate even the small good things to feel our worth. May all of us have a prosperous and healthy new year! We were at SM City Clark just a while ago for the Pyrolympics Fireworks display which was held at the mall's parking lot. And since I have my new Nikon D3000 DSLR with me, we decided to do test shots. Unfortunately, I am not yet aware of the different manual settings of the camera in different light situations so my fireworks photography set turned out to be not that favorable to a photography critique's eyes. Also, I didn't use a tripod that is why the output were kind of shaky and grainy. Hi there, I will be offline most of the day since a couple of friends have invited me to go to Manila and buy stuff for the Holiday party. I also decided to buy myself a gift - my dream Nikon D3000 DSLR camera. I took this chance to buy it since it is way cheaper in Manila compared to the stores here in Pampanga. I think it will save me about $80 which is a lot and I can even use that in buying presents for my nieces and nephews. This is the most wonderful time of the year. Where every family celebrate together and cherish the meaning of Christmas. Our tradition mostly involves celebrating Christmas as a one family, eating together and going to church together. Let us not forget that this day, our salvation was brought into our world to redeem mankind. With that, let us commemorate and thank our Saviour for rewarding us with such blessings. I hope you are all having a great time today. Send my regards to your families and friends. Merry Christmas everyone! This is a personal blog that I maintain myself. Some contents posted here are sponsored however, they always represent my 100% honest opinion. Should you have any concerns, contact me here. My site is open for link exchanges so if you want your blog* to appear on my page, kindly add me to you blog roll first and then send me an email or leave a comment to any of my posts so I can add you up here on my page, too. See you around and happy blogging everyone! *Individual bloggers are only eligible as commercial sites need to sign up an advertisement arrangement. Nyogblog.com is accepting advertisement requests like image banners, site-wide or in-post anchor links and a dedicated write-up. Packages are available in monthly, quarterly or yearly subscription. FYI, Nyogblog.com is affiliated with Enjayneer.com's twitter account (@enjayneer) that has 1000 plus followers. So part of the advertisement package (optional) is the opportunity for your site (anchor text/link) to be tweeted on a regular basis. Also on other social networks like Digg, Facebook, Stumbleupon, Friendfeed, etc. If you wish to promote your business and and start attracting your target market, contact me now so I can help you on your business. If you like to communicate with me privately for confidential concerns, advertisement requests or for suggestions and comments about my blog, you may reach me at anytime through my email admin@nyogblog.com. A couple of friends and I agreed to have a joy ride yesterday since we all have nothing to do at home. One of my friends offered his ride. We went all over the streets of Angeles city and San Fernando. Then, we dropped by at a convenience store in North Luzon expressway near Mexico after which we strolled inside Lakeshore, one of Pampanga's famous luxurious subdivision and event center. Lakeshore is well-known for its light house and man-made lake. Here are some pictures. I woke up late today because I needed to finish a lot of pending projects last night. The day kind of felt strange to me because I felt nostalgic and suddenly craved for Christmas. Memories kept on flashing back in mind especially the happy ones during my childhood. 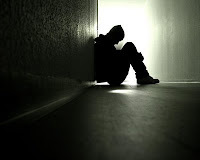 I can't explain it but I am experiencing the feeling of homesickness as well (I am at my home, for your information. Strange isn't it?). Well, just to deviate my thoughts (or I probably scratched the itch, haha), I quickly turned on my PC and downloaded some of my favorite Christmas songs - Jose Mari Chan hits. I transferred some on my music player, put on my headsets and maximized the volume. Now I am more relaxed and composed. We were at Marquee Mall last weekend with a couple of friends. Actually, I often go to the malls during weekend as one way for me to treat myself and shake away stresses and fatigue. Marquee, by the way is the newest Ayala Mall and it is the first here in Central Luzon. Anyway, I just want to share this cool ride that we saw in front of the mall's entrance. I kind of freaked out when I saw the headlights - because they are not lights; they are LCD monitors! Can you believe that? It's like a pimped ride from the famous MTV show. The Philippines' most successful boxer is on the cover of Time Magazine Asia with a five page feature story of him as a boxing champ. The magazine digs deeper into the Manny Pacquiao history by exposing starting from his humble beginnings up to his recent accomplishments as a boxer and a celebrity including the significant persons in his life like Coach Freddie Roach, his mother Dionisia Pacquiao, Chavit Singson and many others. This is it! Manny Pacquiao is getting the perfume of fame all over the world. He even appeared on one of America's famous late night show Jimmy Kimmel Live on November 4th and graced a song number. Rumor has it that Pacman will be releasing a US produced album. OMG, I can't believe that. I am so happy for Manny. 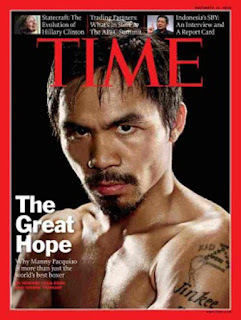 For your information, Pacman is the 1st Asian athlete be featured in the cover of this prestigious magazine. Other prominent Filipinos who graced the cover of TIME Magazine were actress Chin Chin Gutierrez, former Presidents Manuel Quezon, Manuel Roxas, Ramon Magsaysay, Ferdinand Marcos and Corazon Aquino. Watch out for the release of this story as it will also be available in the global edition of the magazine.